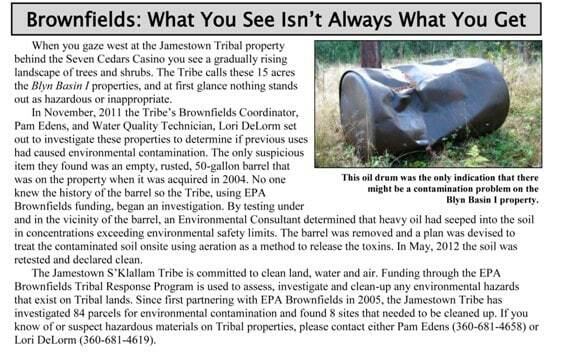 Do you have any concerns about environmental hazards on Tribal property? 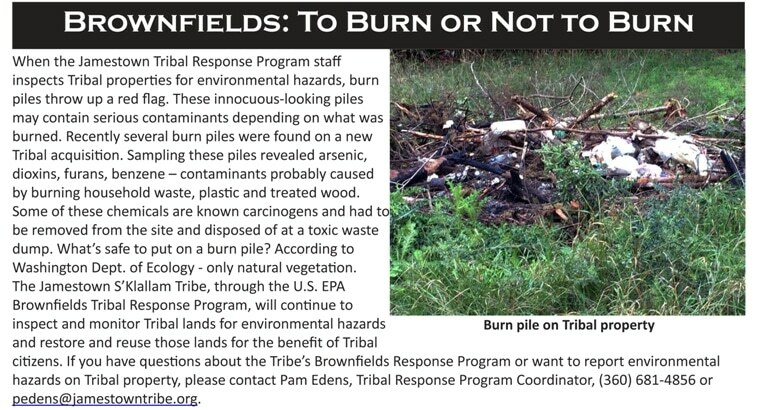 Are you aware of any activity or condition on Tribal property that could pose a hazard to human health or the environment? 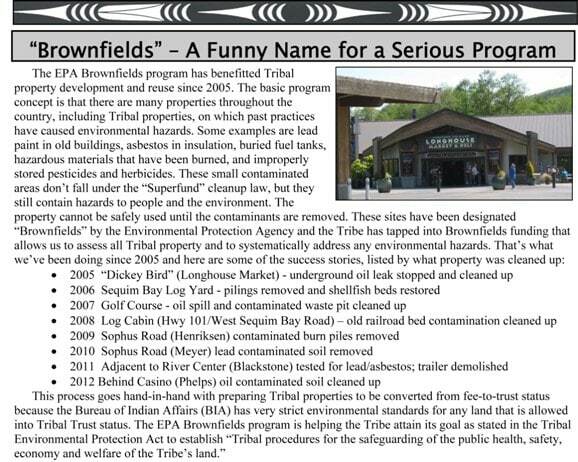 Then you should be aware that the Tribe has a program in place, EPA Brownfields, to assess the environmental condition of Tribal properties to make certain they meet stringent health and safety requirements. 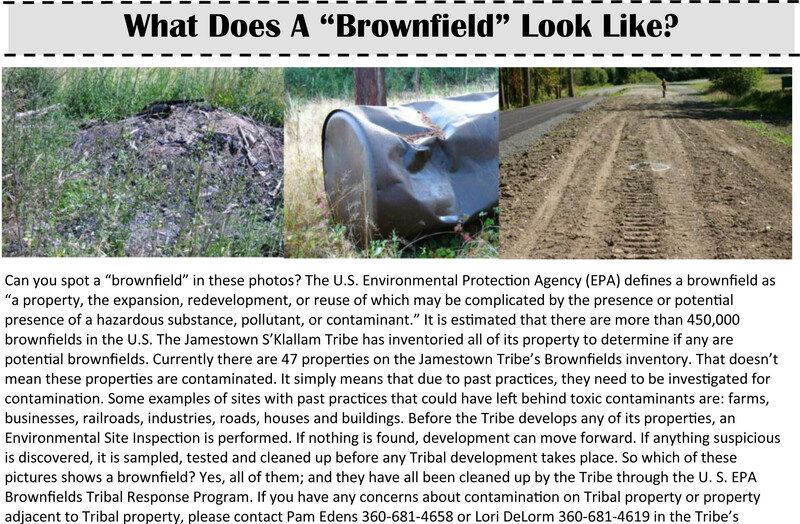 As part of the Brownfields program, Tribal properties are inventoried to determine if past practices indicate any activity that could cause hazardous substances to be present. An example would be the railroad grade that runs through several Tribal properties. 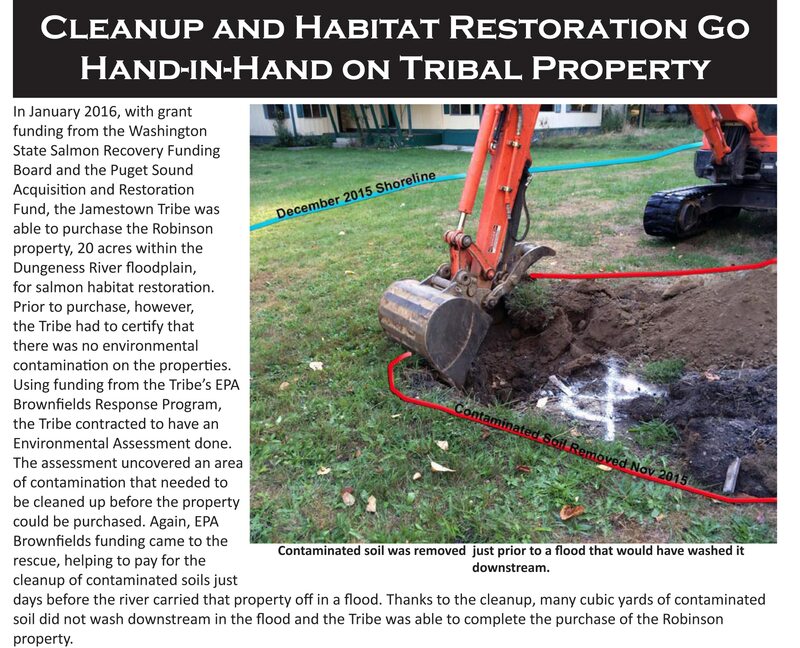 If contamination is suspected, the Tribe hires certified professionals to inspect the property and in some cases to take water and soil samples to determine if cleanup is indicated. 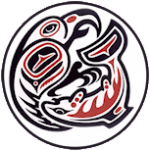 The Tribe uses Washington State Dept. of Ecology standards to make sure any and all contamination is cleaned up and the property can be declared safe for development. 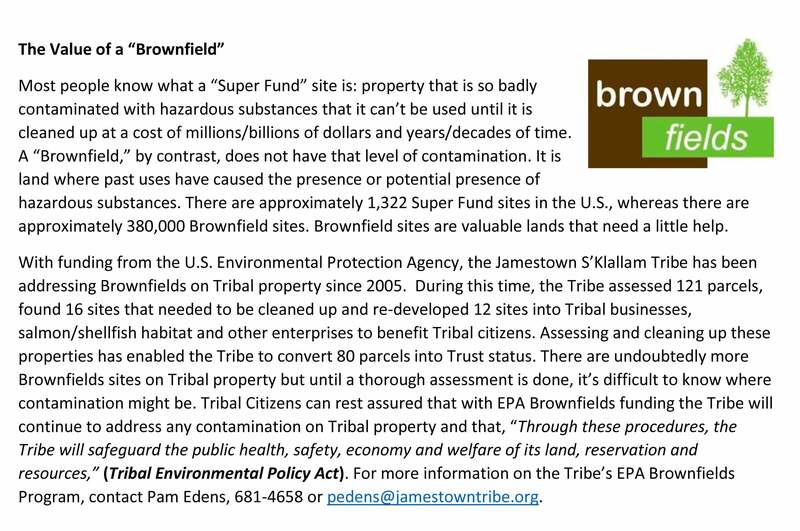 If you would like more information about the EPA Brownfields program or if you have knowledge of hazardous substances on Tribal property, please contact the Tribe’s Brownfields Coordinator, Pam Edens (360) 681-4658. This video was produced by the EPA Brownfields Program and the US Agency for Toxic Substances and Disease Registry (ATSDR). 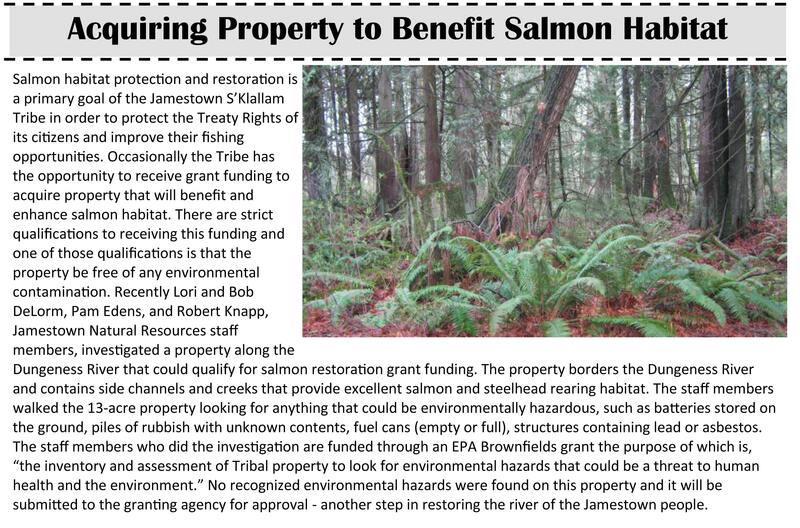 It features the Jamestown S’Klallam restoration of the Jimmycomelately Creek and Estuary, where contaminants were cleaned up and property was restored for the future use of Tribal people. 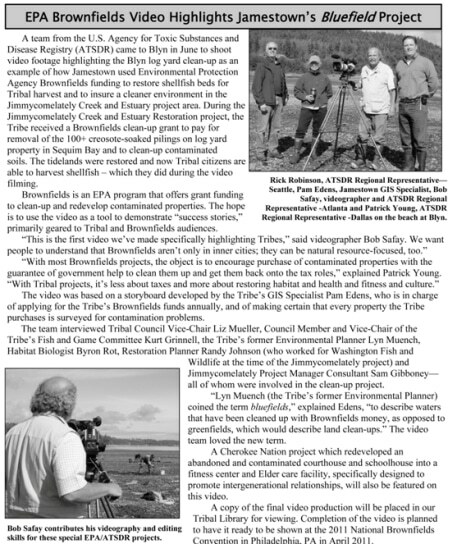 With funds awarded from the U.S. Environmental Protection Agency’s Brownfields Assessment program, the Natural Resources Department has been assessing Tribal properties for potential environmental hazards to determine if any need to be cleaned up before they can be developed, or if they might need to be left undeveloped so as not to expose people to any danger. 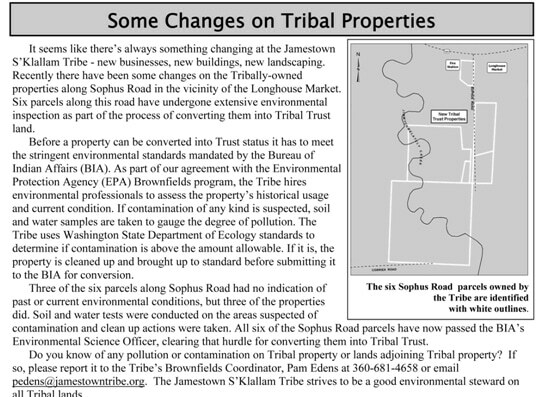 A public record of these property assessments has been established and will be available to the Tribal Community and members of the public in the Tribe’s Library on the South Campus. This public record will remain in the Library and the records of all future property assessments and/or clean-ups will be added to it. 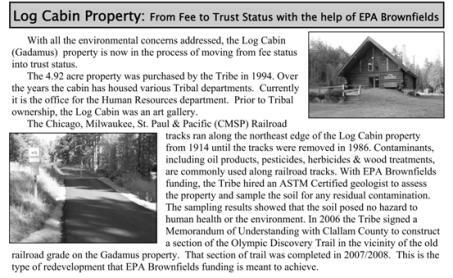 We welcome you to look through the records and if you have any questions or comments please contact either Pam Edens 360.681.4658 in the Tribe’s Natural Resources department. 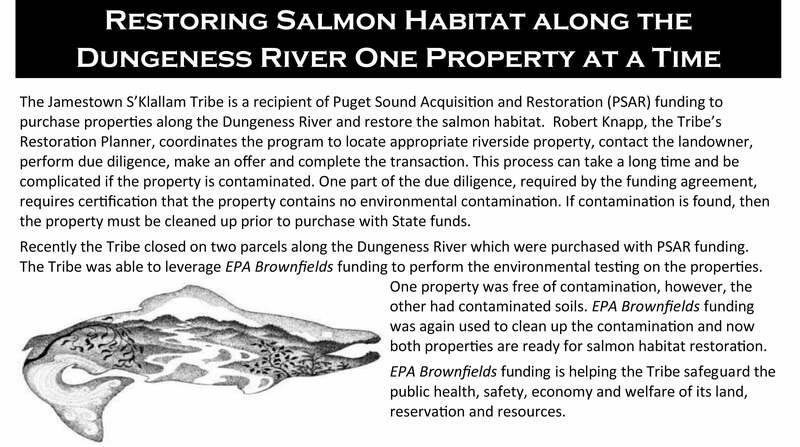 In the Blyn area, the Tribe used Brownfields funding to remove creosote-covered pilings from the old Blyn log yard and to clean-up and restore the log yard area improving commercial and recreational shellfish harvest for Tribal citizens. 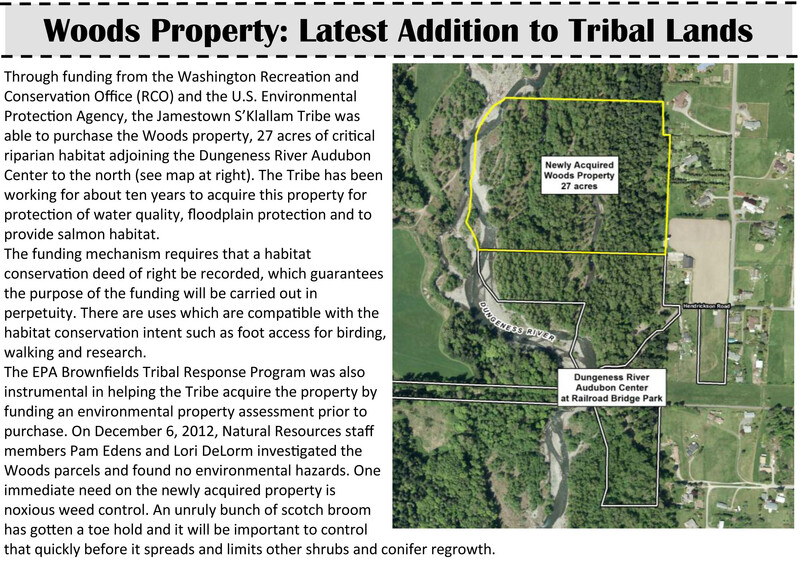 Also in Blyn, the Tribe addressed the environmental hazard of leaking underground storage tanks on the old Dickey Bird Tavern property. With the assistance of Brownfields funding the property was cleaned-up and has been transferred into Trust status allowing re-development into the Longhouse Market and Deli. 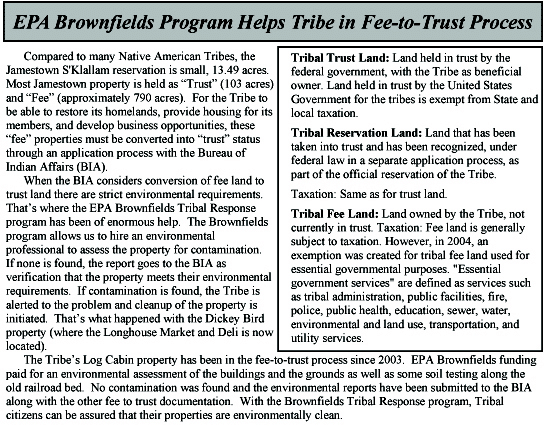 Through the Brownfields program, the Tribe’s Natural Resources department has developed an inventory of all Tribal property holdings and is reviewing each parcel for possible environmental hazards. 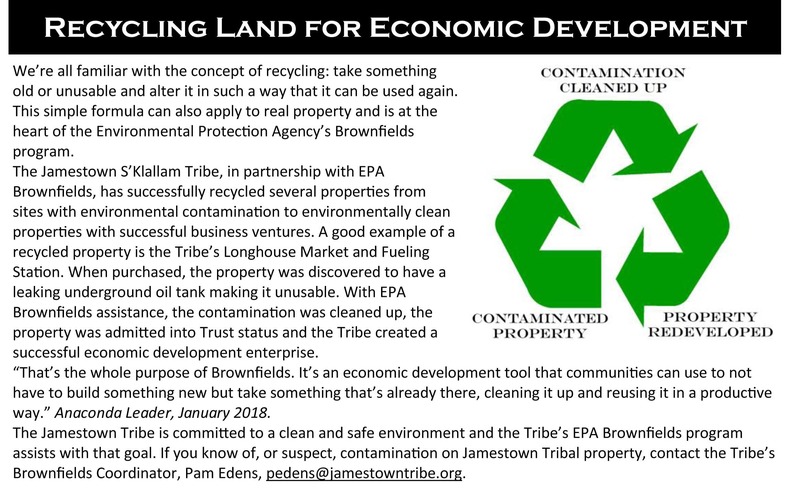 If you have any concerns about environmental issues on any Tribal property or on properties adjacent to Tribal lands, please contact Pam Edens 360.681.4658 in the Natural Resources Department. 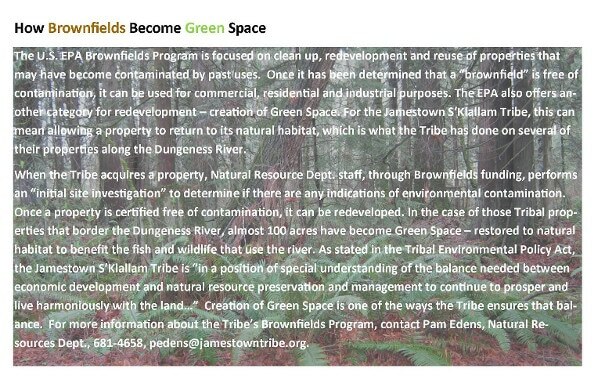 What Does a Brownfield Look Like?